People laughed…in the right places. Last night’s reading about my insane college graduation–(featuring a walkout, two demonstrations and three arrests–at the graduation, not the reading) went well. People laughed…. In the right places. That’s me, in the blue sweater (duh!) with Neil O’Hara, facilitator of The Write Stuff, my wonderful writers group, in the background. The presentation was sponsored by the Libary and the Lincoln Review, where I sometimes write about the arts. 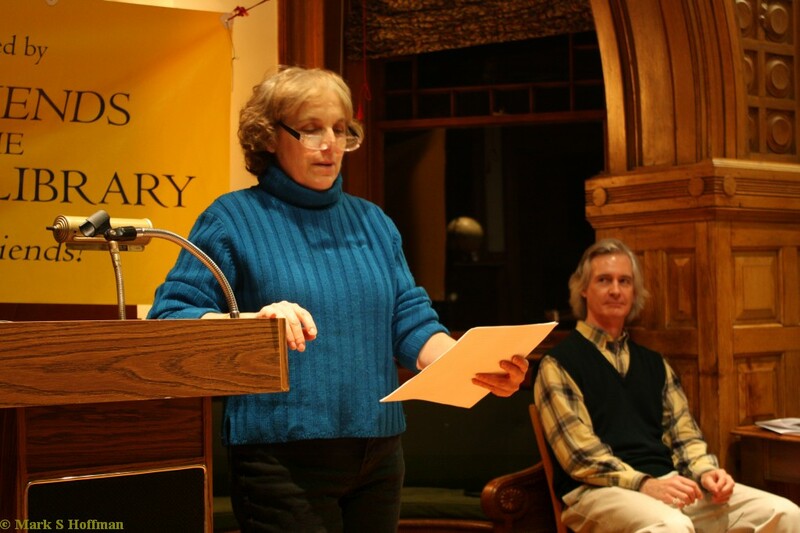 Other readers included Susan Coppack, Mary Ann Hales, Ellen Morgan and Manson Solomon. Here’s a link to the Write Stuff Blog, http://lincolnwritestuff.blogspot.com/ which, in turn, links to this and other write stuffers’ blogs, courtesy of blogmeister Geoff Moore. Mark S. Hoffman took the photo. Thanks, Mark! Cornell Class of 1970 has a Web site! Who knew?